We were looking for a great four person costume to wear to Toronto’s annual Halloween street party. For my wife, myself, and one of our friends, we’ve been doing this for a few years and have really enjoyed the crowds and the camaraderie; however, this would be the first time for our fourth and he was feeling kind of awkward about dressing up for Halloween as an adult. So we decided that it was important to choose something that would make us look cool and really knock their socks off. 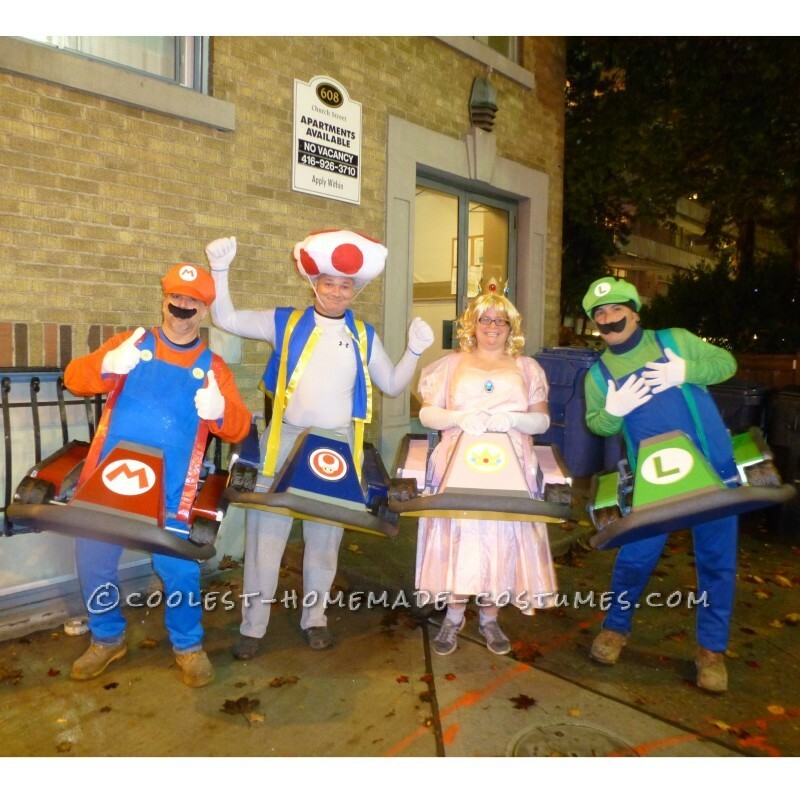 We met one Saturday night in late September and scoured the internet for cool group costumes and came up with a Mario Kart theme. 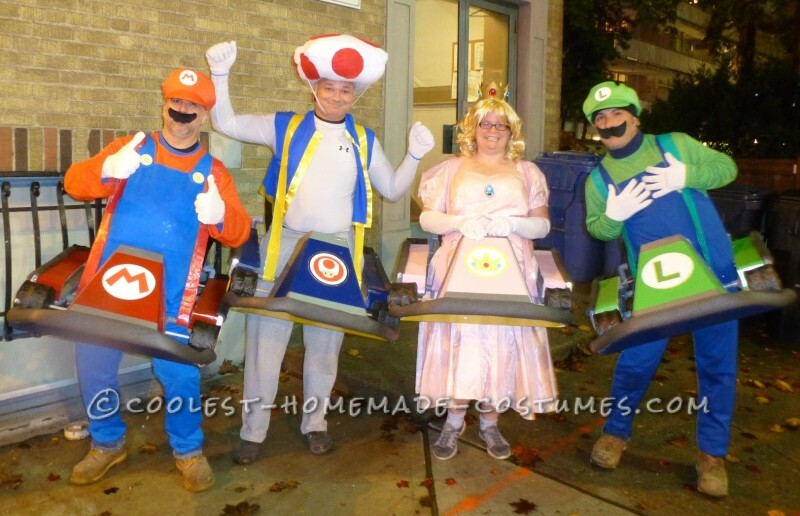 The idea was that we would dress as the characters and then wear karts around our waists. I had recently been laid off from my job, so I volunteered to create the carts. This is gruesome tale of their contruction. So the first step was deciding which Mario Karts to build. 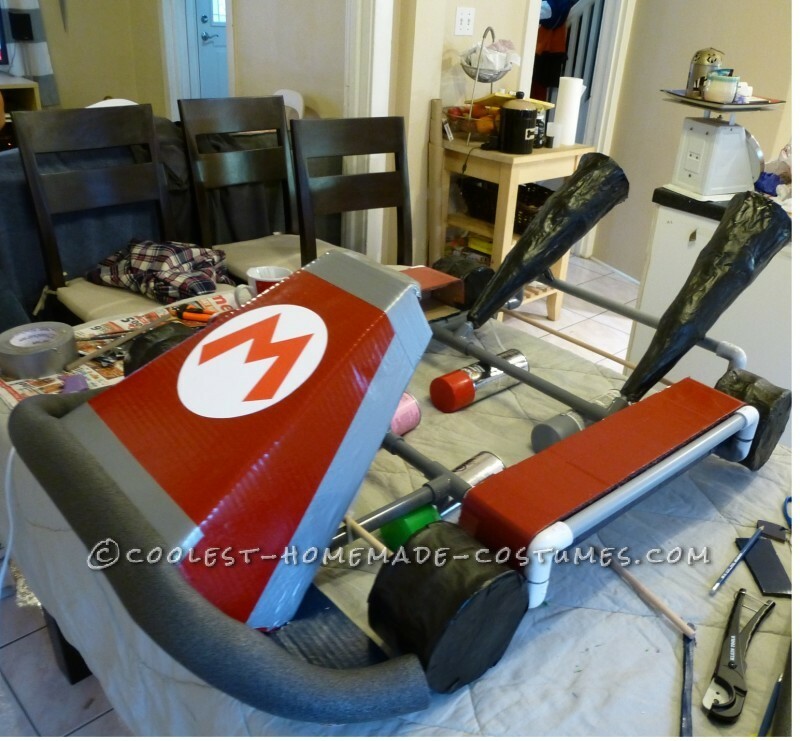 I scoured Google images and decided on the Mario Kart 7 kart because it was mostly angular, so I thought I could achieve it without having to build too many complex curves. 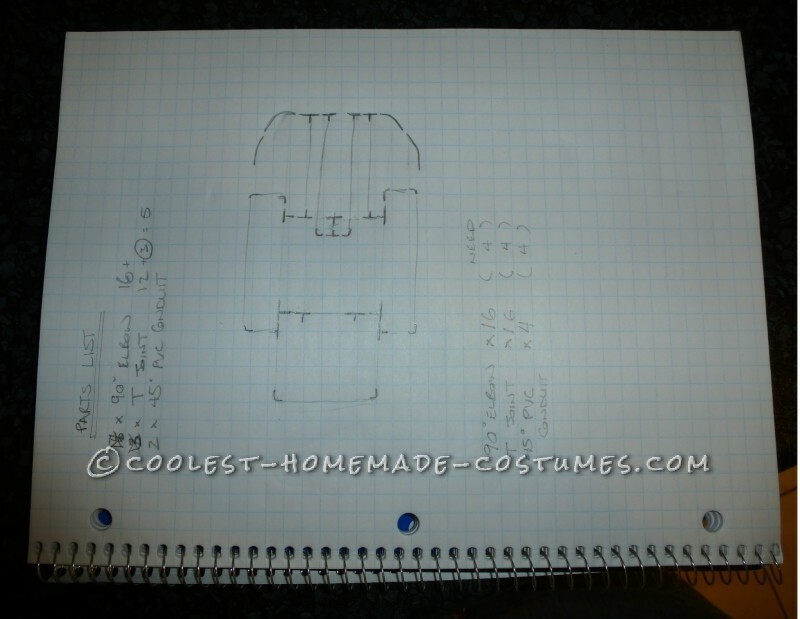 I then made front and side view drawings of the kart so that I had the relative dimensions we would use. During this step, I thought a lot about how much space the person would need to be comfortable, how to balance the weight of the front and the back (I failed at this in the end), and how to maintain the correct shape of the cart so that the karts would be recognizable. I really want people to get it at first glance. See the attached sketch. 5/16″ dowels for the axels and exhaust attachments. The last design step was to figure out the frame configuration. I’ve attached a sketch of the frame. 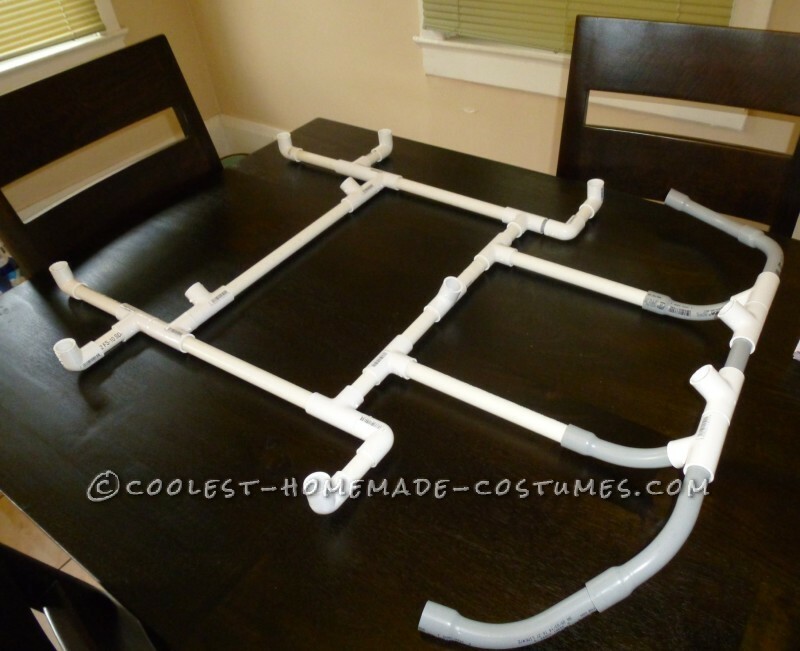 I used a combination of 1/2″ PVC electrical conduit (grey) and plumbing pipe (white) for the frame. The plumbing pipe were stronger, and so I used them for all structural elements. They were also twice the price, so I used the electrical conduit as much as possible. I got the pipes, all the joints, the cutting tool, and the cement to glue them together at the Home Depot. 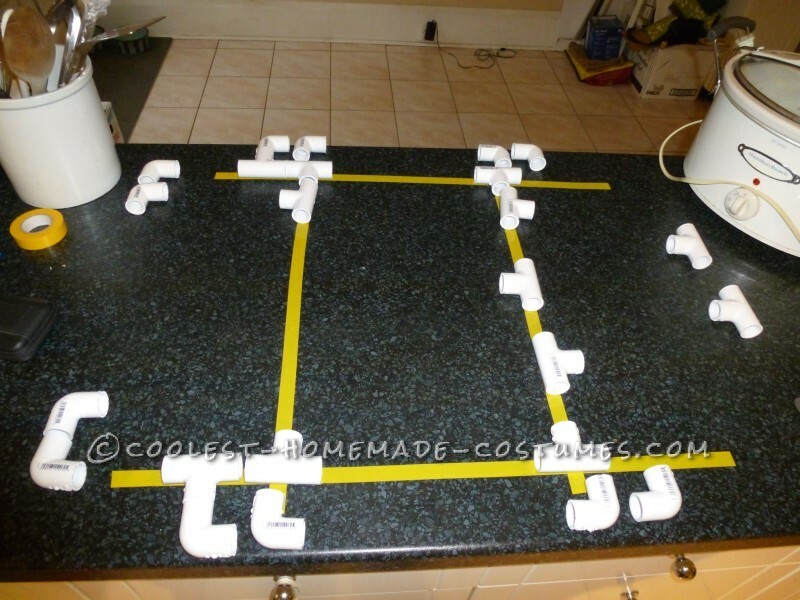 You can buy a tool to cut 1/2″ PVC pipe, that looks and works like scissors. These are a life saver when faced with the possibility of using a hacksaw for the large variety of cuts for each cart. I bought first pair I found for $22. They worked, but required a large amount of hand strength to use. Later, I found a ratcheting pair for $10, that worked just as well and saved the hand (sadly, it was too late for me to buy them, but you can!). When cutting pipes for measurements, remember that there is some extra space in each joint. In mine, it was about 1.6cm per joint to the length of what I had cut. So I subtracted that amount for each joint that I planned any given length. NOTE: T-joints use that much twice when connecting both ends. If the point above seems confusing, it brings home this point. DO NOT MEASURE AND CUT THE PIECES WITHOUT FITTING THEM. As I worked with the pipes, I discovered that small variance in angle of joint or counting length varied the end product a lot. As a result, I put each peach on the frame as I cut them, and then measured the next piece as needed. When my friend tried to help by cutting a bunch of pipe before hand, it was a tonne of work to go back and trim bits and pieces to make it all fit. I had a hell of a time getting all of the joints I needed. All total I needed 64 elbow joints and 64 T-joints for all four karts. Home depot only stocks about 40 over store max. I spent about three hours driving around the city looking for parts. If you find a bunch early, buy them! The next step was building the wheel and the exhausts. At this point, my wife and friends got in on the party. We built the wheels’ skeletons out of three cardboard disks, spaced with more cardboard. 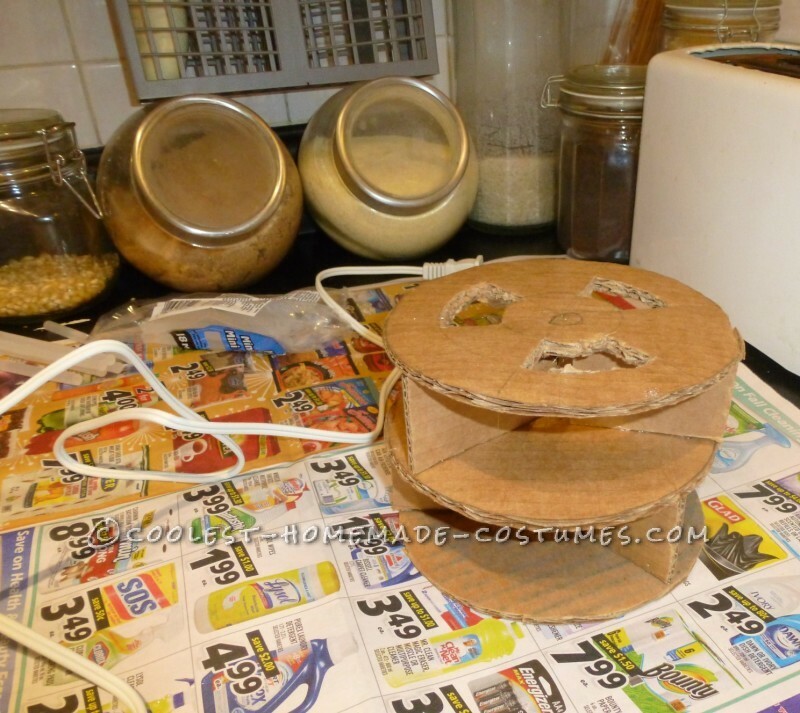 Similarily, for the exhausts, we glued cardboard disks onto wooden dowels. The whole lot of them were papier mache’d with a few layers of newsprint. In the end, these were strong but didn’t look great. They were fine in the overall costume, but on an individual basis, the finish wasn’t as smooth as I would have liked. 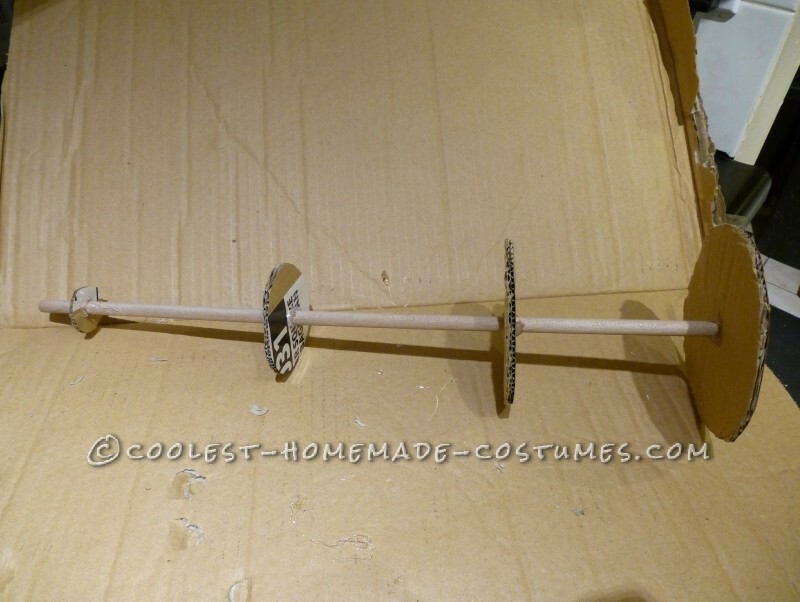 When the wheels were dry, we drilled holes through two layers and glued them to wooded dowel axles, which were zip-tied to the frame. NOTE: we used 5/16″ balsa dowels for lightness, but they were just barely strong enough to support the weight of the final karts. If your karts need to support their own weight, I suggest going thicker. The exhausts’ dowels were glued into small pieces of pipe which we push into a spot left open in the frame. The last major step were the panels. 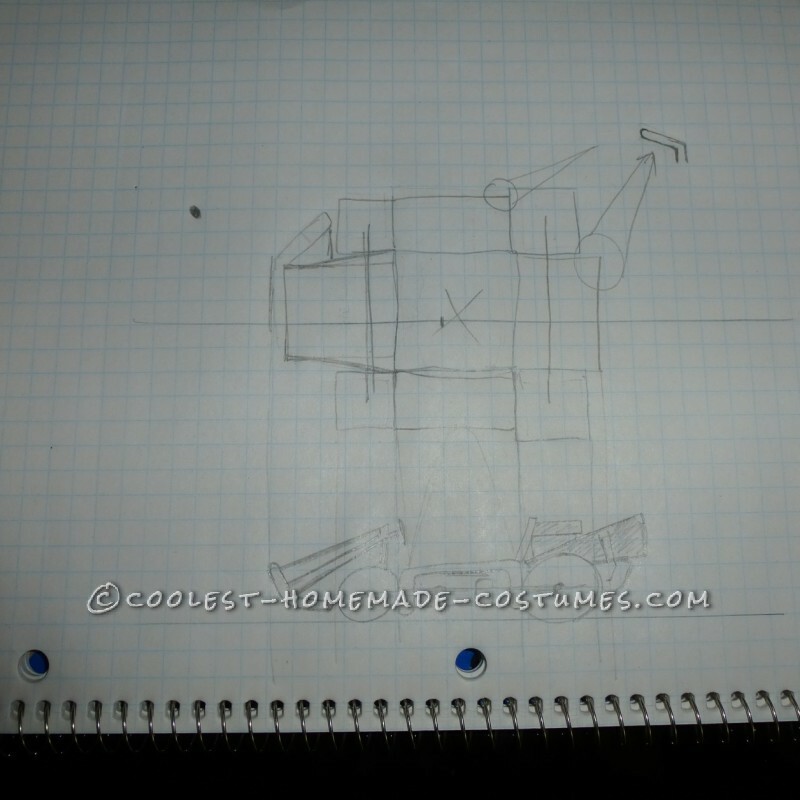 For this, we used crape paper to make patterns from each kart. NOTE: measure each kart separately, they ARE different. We then copied the patterns onto cardboard and cut them out using Exacto knives. The next step was to achieve the smooth bends. For this, we drew where the bends were on the bottom side of each bend and wet that line using a bowl of room temperature water and a basting brush. NOTE: don’t get the pieces too wet. You only want the top layer and the ribs of the cardboard to be soft. 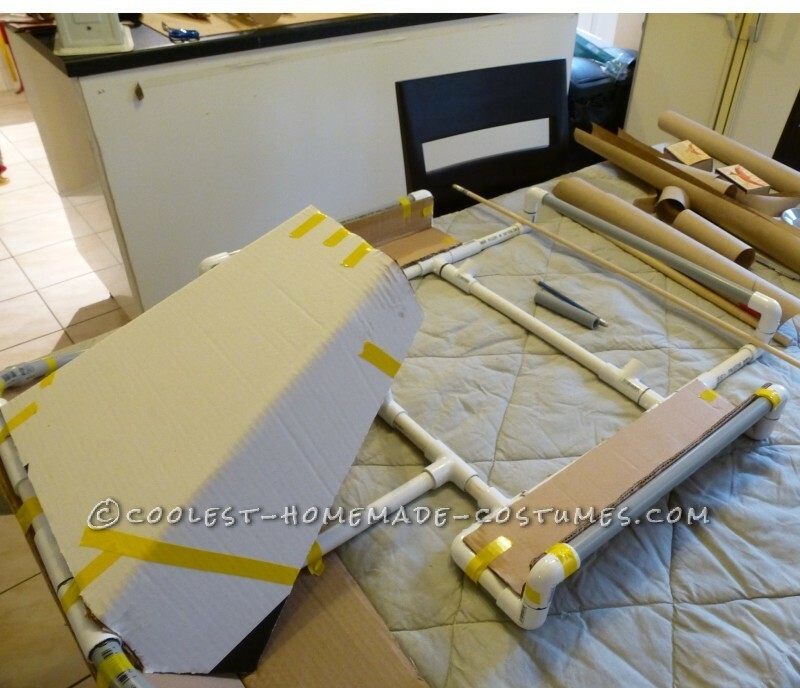 From here, I used a piece of PVC pipe to bend the cardboard. Slow and steady was the trick here. Once the pieces were bent, we put them on the kart, taped them into the correct position and let them dry to the shape. All total, there were bottom and top panels on the side portions, a bottom wing on the front, and the top hood portion. We used hot glue, electrical and duct tape to attach the panels to the frame after they were painted. We used automotive spray paint on all the parts, for look and water proofing (it was a rainy Halloween here). 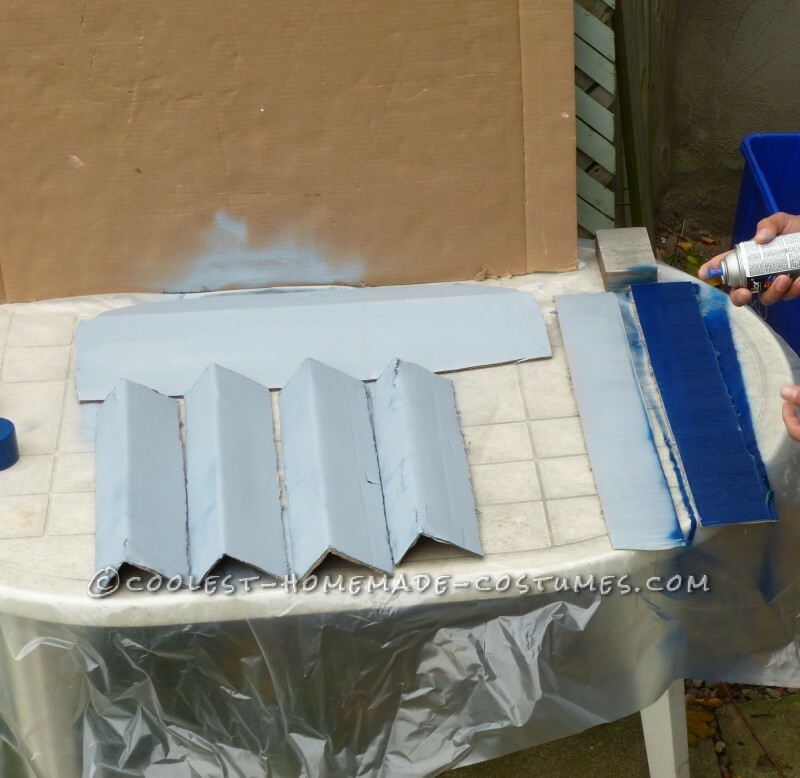 It took between three and six coats for each part depending on the coulor and we started all pieces with a grey primer. My wife printed out the correct logos for each character on high quality paper in full color. We cut these out and used spray glue to stick them to the front of the karts. We used duct tape around the edges of the hood to replicate the look of the game’s karts. We used 1/2″ pipe insulation on the front and side exposed pipe to emphasize the frame, like in the game. We spray glued yellow construction paper circles to the wheels to look like rims. We taped colored duct tape together to make shoulder straps and measured them for each person. We also built little engines for the back portion out of spray painted shoe boxes, but they got kncked off by our bums early into the evening.